The Cloquet Terminal Railroad in Cloquet, MN is a short line owned by Sappi Paper operating on about six miles of track with connections to BNSF and CP. Until 2002, this was the Duluth & Northeastern Railroad, which was the last logging railroad in Minnesota. Two SW1 switchers, built in 1941, provided the power for the charter. The pair arrived on the property in the winter of 1963-64 to replace the last steam locomotives, including #28, which was being restored to operation here at the time of our visit. With a new paint scheme applied in 2002, the World War II-era diesels look like they still have many good years of service ahead! Our second photo charter took place on the former Duluth, Missabe & Iron Range Railway line between Duluth and Two Harbors, MN. The North Shore Scenic Railroad today operates a variety of long and short trips on the line, starting from the historic Duluth Union Depot, which is also the home of the prestigious Lake Superior Railroad Museum. The charter organizers disguised one of the railroad’s RDC cars as DM&IR #1, which operated on this line in the last days of passenger service. The car was built in 1951 by the Budd Company for the New York Central, and was last used in regular passenger revenue service by the Alaska Railroad as late as 2009. This was an exciting fast-paced afternoon traveling with the stainless steel clad car in brilliant sunlight. Our third photo charter also took place on the NSSR, but 10 years earlier. Great Northern NW-5 #192 pulled a train of vintage GN passenger cars while Soo Line FP-7 and GP-30 led a string of classic iron ore cars. The two consists represented what might be typical equipment found on North American railroads in the mid-Twentieth Century. The day was beautiful and our three diesels put on a great show! Our footage was captured with multiple tripod-mounted HD cameras (third chapter is analog) / Running time approximately 42 minutes / Conveniently organized by chapters / Minimal narration - less talk, more action! 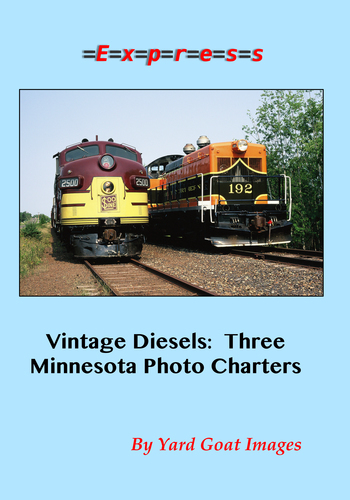 Preview - Vintage Diesels: Three Minnesota Photo Charters from Yard Goat Images on Vimeo.